I am a snacker…and there is no closeting about it. I do it at my desk at work or right after lunch when I “thought” I was full or in the car or while watching television. I could go on and on, because it doesn’t matter, I will snack. Well since going clean, my snacking has been relegated to celery…mmm. I do like celery and do love the crunch and the hand-to-mouth motion of it. But sometimes you need more. Sometimes you need more substance to the snack then the ten calories per large stalk. In come the nuts. A great go-to for before or after a workout or needing a quick pick-me-up, but nuts are so easily over eaten. I mean how often do we read the nutrition label and weigh the 1 ounce out? It is more like we dig our hand in to a mixed nuts container and hope we come out with mostly cashews instead of peanuts. So, I decided to make my own 100 calorie pack of salty-spiced nuts. I had to do some research on how to do this vegan style since the one time I made cinnamon sugar nuts was in my vegetarian days about seven years ago and used egg as the coating. It seems oil is the way to go, and with only using one tablespoon it didn’t add too much calories, so that was good. These are more salty then spiced, which is good for me since my doc told me I have very low blood pressure and need to add in salt to my diet, since I don’t cook with it I rarely get actual salt. And I only used cinnamon; it is a faint flavor-nothing over powering. Next time I will try other spices and see how that works. 2. In medium bowl add oil, salt and cinnamon. Mix well. 3. Add almonds, and using a spatula coat all almonds with mixture. 4. 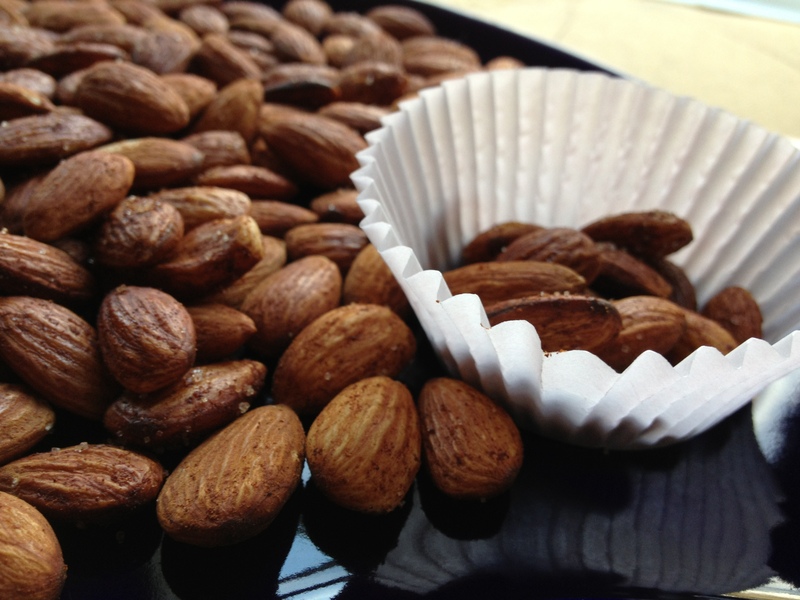 Spray baking sheet with Pam and spread almonds on sheet. 6. Portion into 25 portions (about 15 almonds). I know it isn’t very green, but automatically portioning into baggies means you know what you are getting at each snacking. March 2, 2013 in Uncategorized. A trick to make this more green, is to recycle the bags. By which I mean wash them after use and reuse. I do this all the time, only time I find you can’t reuse them is if they go in the microwave. After they start to look worse for wear I sometimes use them for potting plants. Place some holes in one for drainage and place in the bottom of the pot, keeps the soil in, then I fill with soon and plant, cut a hole in one in the middle and to one edge so it fits around the plant ( I always make sure to put little holes in this one and not cover the whole pot, then put rocks or mulch on top – helps keep weeds from growing through. I do this also-I take celery everyday to work and reuse my baggies.